Sound & Video Contractor (SVC) is offering free Dante Level 1 Certification to AV professionals on Feb. 19 at 2 p.m. ET. The webinar will be host by SVC editor Cynthia Wisehart and Audinate's technical training program manager Danu Vino. 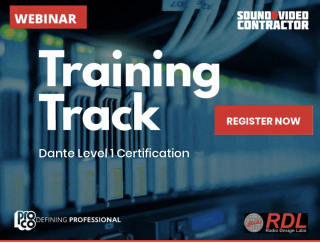 Level 1 Certification covers Dante audio networking concepts, audio networking fundamentals, how to create a small-scale Dante network, and how to use Dante Controller and Dante Virtual Soundcard. This course is a pre-requisite to Dante Certification Levels 2 and 3. This one-hour curated interactive training session will introduce Biamp's training and certification program with an actual hands on training session on VoIP. Attendees will be eligible for Dante Level 1 certification and 2 CTS RU upon completing the webcast and Level 1 exam. To learn more or to register, visit bit.ly/SVCDante.